Richard B. Johnston Jr., BA’57, MD’61—a renowned immunologist and pediatrician who has dedicated his life’s work to improving the health of children—is the recipient of the Vanderbilt University Alumni Association Distinguished Alumni Award. The honor is the highest bestowed to a member of the university’s alumni community. Established in 1996 by Vanderbilt’s Alumni Association, the award recognizes an alumnus/alumna whose accomplishments and contributions have had the broadest impact and most positive effect on humankind. Recipients of the Distinguished Alumni Award are celebrated for going beyond their successful vocation and bringing benefit to the universal community. As national medical director of the March of Dimes, Johnston led an effort that has significantly reduced birth defects such as spina bifida. After medical research found that consuming folic acid prior to and during the early stages of pregnancy reduced the occurrence of neural tube defects, Johnston led a national folic acid public awareness campaign. He brought the nation’s obstetrician-gynecologists, pediatricians and nurses together to enlighten and educate women of childbearing age of the importance of folic acid in preventing certain birth defects. His leadership ultimately led to the Food and Drug Administration’s 1998 ruling to add folic acid to America’s grain supply, which has since significantly reduced neural tube defects such as spina bifida in the United States. Johnston has also served as the president of the Society for Pediatric Research, the American Pediatric Society, and the International Pediatric Research Foundation. He has chaired seven committees of the Health and Medicine Division of the National Academies of Sciences. 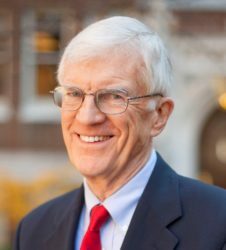 He currently serves on the Vanderbilt University Medical Center Board of Directors and formerly served on the Vanderbilt University Medical Center Advisory Committee for the Board of Trust and on the Vanderbilt University Medical Alumni Affairs Board. His impressive list of professional accolades includes the John Howland Medal, the highest honor bestowed by the American Pediatric Society, the Harvey Wiley Medal from the FDA, and the David Rall Medal from the National Academy of Medicine, of which he is a member. He also received the Distinguished Alumnus Award from the Vanderbilt University School of Medicine in 2008. Johnston spent most of his career at the University of Colorado School of Medicine and National Jewish Health, starting in 1977 as professor of pediatrics. In 1986, he became chair of the Department of Pediatrics at the University of Pennsylvania and physician-in-chief at Children’s Hospital of Philadelphia. He later joined the Yale School of Medicine, before returning to the University of Colorado School of Medicine and National Jewish Health in 1999, where he was the associate dean for research development at the medical school for 14 years. He is currently professor of pediatrics emeritus, and his 284 full publication credits include 171 original research or conceptual articles, 22 books as editor or author, and 91 chapters or reviews. Johnston lives in Denver with his wife Mary Anne, a 1960 graduate of the College of Arts and Science. They have three children, Richard, a 1985 graduate of the College of Arts and Science and a 1989 School of Medicine alumnus, Claiborne (Clay), a neurologist and medical school dean, and Kristin, a clinical psychologist. They have seven grandchildren, one of whom will enter Vanderbilt this fall.